1. Season the steak well on both sides with the Cajun spice, allow to stand for 15 minutes before cooking. 2. Heat a grill-pan until piping hot and lightly grease with oil. Cook the steak for 5 minutes on the one side and then 5 minutes on the other side. If you want it more well done, then cook for longer. Leave the steak on one side off the heat to rest for 10 minutes before slicing into strips. 3. Sauce: Heat the oil and fry the onions and garlic until softened. Add the rest of the ingredients and bring to the boil, allow to simmer uncovered until sauce thickens. Adjust the seasoning with salt and pepper. 4. 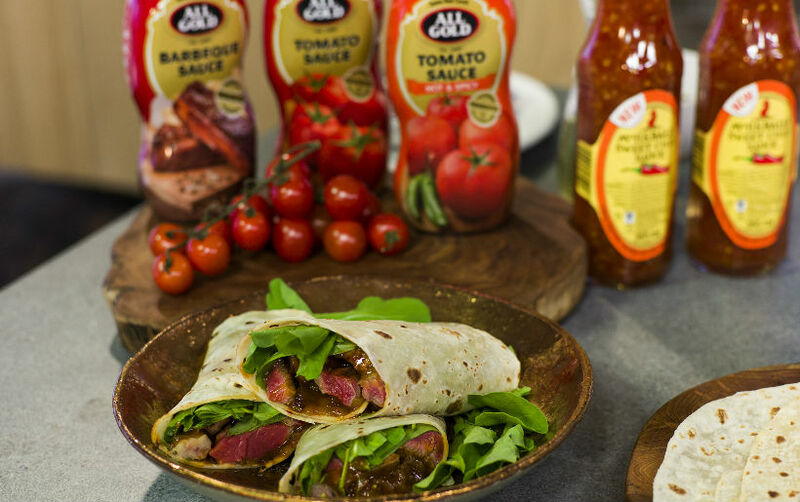 When you are ready to wrap, place a lot of rocket in the middle of each wrap, divide the meat between the wraps and lay on top of the rocket. 5. Top with a lot of the onion relish and bring the side in and then roll the wrap up like a spring roll. 6. Slice in half and serve whilst warm. Can also be eaten cold.